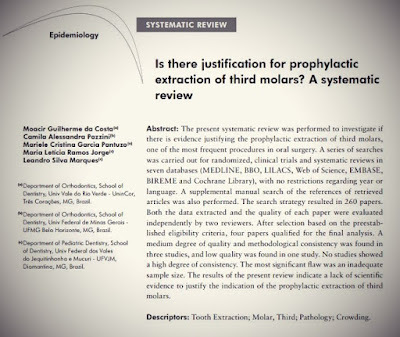 The present systematic review was performed to investigate if there is evidence justifying the prophylactic extraction of third molars, one of the most frequent procedures in oral surgery. A series of searches was carried out for randomized, clinical trials and systematic reviews in seven databases (MEDLINE, BBO, LILACS, Web of Science, EMBASE, BIREME and Cochrane Library), with no restrictions regarding year or language. A supplemental manual search of the references of retrieved articles was also performed. The search strategy resulted in 260 papers. Both the data extracted and the quality of each paper were evaluated independently by two reviewers. After selection based on the preestablished eligibility criteria, four papers qualified for the final analysis. A medium degree of quality and methodological consistency was found in three studies, and low quality was found in one study. No studies showed a high degree of consistency. The most significant flaw was an inadequate sample size. The results of the present review indicate a lack of scientific evidence to justify the indication of the prophylactic extraction of third molars. Third molar extraction is one of the most frequent procedures in oral surgery. Ten million teeth are extracted from approximately five million individuals every year in the United States alone, with an annual cost of over US$3 billion. In England and Wales, expenditures on prophylactic extractions between 1995 and 1996 amounted to approximately £5.2 million. The reason for these extractions is the high incidence of impaction, often associated with a number of oral problems, such as pericoronitis, periodontal defects in the distal region of the second molar, caries in the third or second molars, different types of odontogenic cysts and tumors, and crowding of the lower incisors. Although a number of studies have been published on third molar extraction, the conflicting results hinder the decision-making process. The controversies are related to inadequate study designs, small sample size, insufficient monitoring time and methodological flaws. 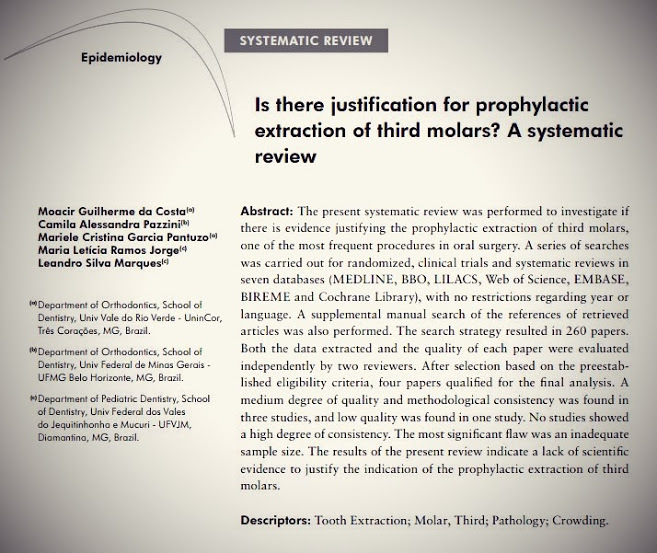 The aim of the present study was to perform a systematic review of the literature, to discuss consensual aspects and controversies related to third molar extraction, and to answer the following question: Is there evidence to justify the prophylactic extraction of third molars?